Around 80 riders – many former soldiers – took part in a protest ride following a decision to charge a veteran over Bloody Sunday killings. 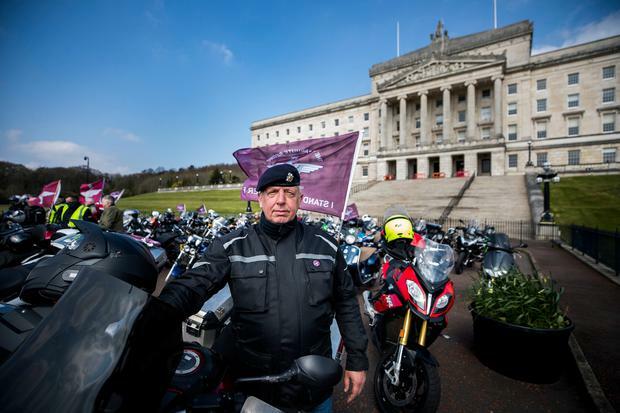 A veteran who took part in a protest ride to Stormont in support of Soldier F who is being charged over Bloody Sunday fears more prosecutions could follow. The man, who gave his name as Tony, said he was involved in an incident during Northern Ireland’s troubled past and felt he was dealt with fairly at the time. But he queried whether he should now expect a knock at his door. Tony told Press Association: “Where will it end? We have the flags that say we support Soldier F but it is not only about Soldier F, it’s soldier a, b, c… and all after. “Where are they going to go then, once they have finished with the alphabet, where will it end? “We are saying that we want it to stop here. Soldiers carried out their duty at the time, they did as they were told. “I was involved in an incident whereby I was detained, interviewed and released. “I believe I was dealt with justly at the time. Do I sit and wait for 20 years for a knock at the door? The event took place in Belfast as a similar Rolling Thunder demonstration took place in London. Around 80 riders, many of them military veterans, set off from the Cultra, Co Down, and arrived at Stormont, the seat of devolved government in Belfast, at around 1.30pm. Another participant, John Hutchinson – who served with the Prince of Wales Own Regiment of Yorkshire – said he feels Soldier F has been “scapegoated”. “The officers who were in charge at the time and all the politicians are now dead. After the Saville Inquiry there has been this rump of an investigation and it seems it has become a sop to nationalists,” he said. “One person is possibly going to be prosecuted for an event that happened in 1972 and after all those known terrorists got letters of comfort and have not been prosecuted, I don’t think it is fair that soldiers can be done, yet terrorists get to walk. Some relatives of the 13 killed in Londonderry on January 30 1972, one of the most notorious days of the Northern Ireland Troubles, have long campaigned for justice.